Rising three stories, the ground-floor atrium draws attention upward to an amber-colored wood ceiling and a hanging conference room that seems to defy gravity. Two sets of 34-foot-wide Spanish Steps, named for the famed staircase in Rome, invite spontaneous gatherings on tan and purple cushions placed in the center. Intimate groupings of soft benches and tables punctuate the open space. This is the 6,000-square-foot Collaboration Plaza, the aptly named central atrium and heart of the Global Hub. Far more than just the name for this gathering space, collaboration is the soul of the entire building and of the Kellogg culture. The Global Hub is designed in its form and function to enable greater collaboration among faculty, staff, students, Kellogg and the world. Above the Collaboration Plaza sits a second, 9,000- square-foot, two-story atrium, the Faculty Summit. 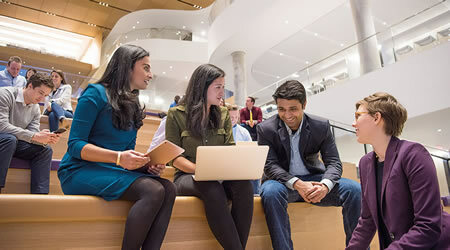 Here, Kellogg’s leading research and practitioner faculty and their guests from around the world will discuss and debate the latest social science and business findings on people, networks, organizations and markets. Surrounding a central piazza are six glass-walled meeting rooms on two stories, seating 20 to 60 people each. The design of the Faculty Summit is meant to facilitate both formal and informal connections, to ensure that thought leaders from across academic disciplines and business functions are constantly intermingling. On floors two and three, the building hosts the magnificent two-story, 6,600-square-foot White Auditorium. This 300-seat global stage sits against a backdrop of Lake Michigan to the east and the Chicago skyline to the south. This one-of-a-kind venue will host CEO “fireside chats” as well as conferences and panel discussions that bring academic, business, civic and thought leaders together from around the world to discuss the world’s most complex business problems. “The building embodies Kellogg’s global standing and distinct identity as an educator. It honors how we uniquely undertake research, teaching and community building,” said Dean Blount.